It looks as if once again T-Mobile BlackBerry business customers are getting the edge. 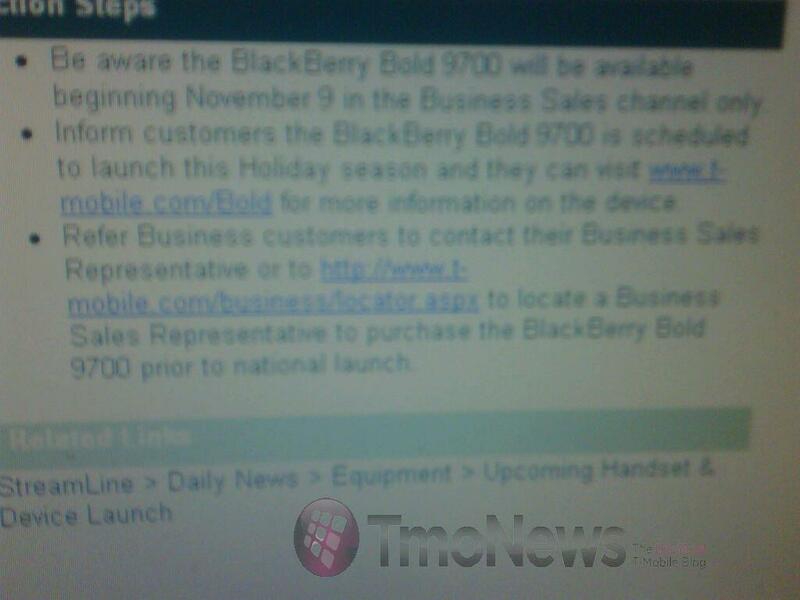 You might remember BlackBerry business users were able to get the Curve 8900 (Curve 2) a week or two before its official launch to the public in January 2009 and now according to the pic above, current T-Mobile BlackBerry users will be able to order a brand spankin’ new Bold 9700 on November 9th through T-Mobile’s Business Sales Channel. But not to worry T-Mobile has promised the rest of its loyal subscribers that the 9700 will land in your hands this Holiday season (cough…November 16th). With only 11 days until this 3G breathing BlackBerry comes to T-Mobile, I think we can all wait the extra 7 days. Hit the jump for a larger image! And don’t forget to leave your thoughts in the comments! since when was the 9700 offered in january 2009? Meant the curve2, post fixed! I”m really hoping employee sales open this same day. i remember it as well, and i alaso remember consumer customers were still able to order/upgrade to the 8900 on the same day anyway by speaking to the business dept. Can hardly wait to get one of these babies. David keep up with good work. You rock. TMONEWS is super !! Ima call customer service and sweet talk her into getting me one early. I hope. I am tired of waiting. It’s been soooo long. I just want to add one more thing: David keep up the good work. You are doing great. Really appreciated. T-Mo and T-Mo News FTW! This is not a curve, its the Bold 2. Pretty sweet though, keyboard easier to use than the 8900 BB. Still pretty small light weight like the 8900 w/ the nice leather back cover. Umm question? If I am on a business account, can I call in and order it outright without resign my contract? Or this is a extend your contract deal only? I just called the business department. Technically ANYONE receiving a corporate discount, even though not necessarily entitled to corporate rate plans, is eligible to receive business account promotions. So if you get that 10% off a month for working at McDonald’s, you are a business account! Just call the business department on monday! I’ve been bounced back and forth between business sales and Customer Care 3 times now… no one seems to be able to order this phone for me! Just got off the phone with T-Mobile customer service and they say that it launches tomorrow everywhere, November 11th.